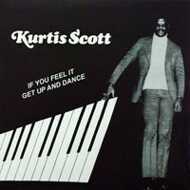 PPU's first book and record highlights the poetry and home recordings of Bronx soul legend Kurtis Scott. Poet, Actor, Producer, Singer, Professional Boxer, the multi-talented Kurtis Scott does it all. While working on the re-release of "Get Up And Dance", Kurtis mailed me a tape of his script from the biopic "T. Lewis Stone" the story of Kurtis Scott's boxing career. The tape plays for about 30 minutes and it's just Kurtis talking describing the scenes and acting some of the parts.. During the workout training montage the music "Uncrowned Champion" is playing in the background, on the tape Kurtis begins to improvise over the organ instrumental.. That is the origin of this recording, and most likely it was recorded with a hand held tape recorder or boombox, if you listen close you can hear Kurtis shuffling to the music in the background.. That being said we make no apologies for the sound quality because this song is phenomenal and having it available for all to hear is enough for me. Included with PPU-028 is "Down But Not Out" a collection of poetry from Kurtis Scott.